For Washington Latin teachers, a commitment to reading is not limited to the books we assign in class. For many years we have assigned books for our whole faculty to read over the summer. And often groups of teachers will decide to form book clubs. This year we are continuing to build on this tradition, with monthly books that teachers commit to read as part of a Faculty Reads Initiative. The purpose of the monthly book clubs is to find common ground and a lens to dig deeper into some of the challenging aspects of teaching to better inform our practice. 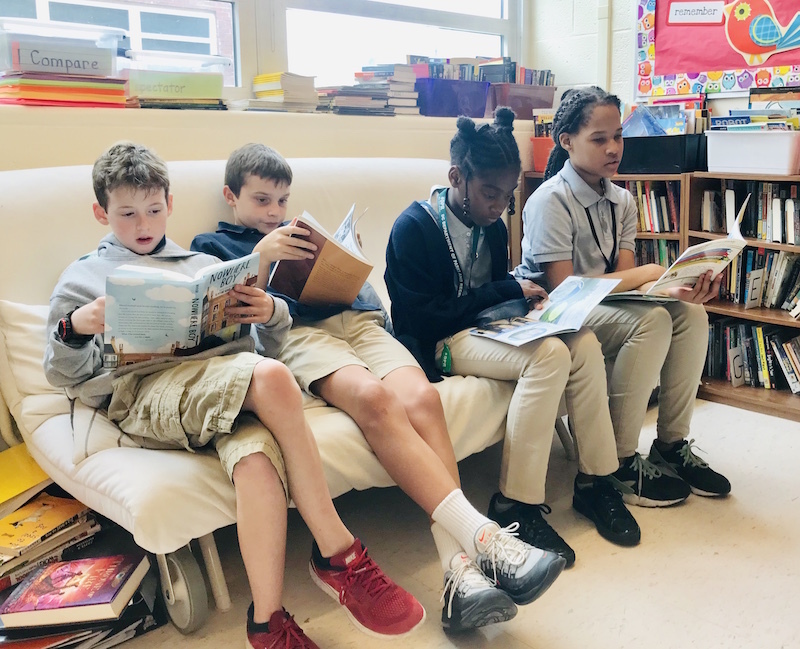 Just like the discussion-based book groups which engage our students in English and history classes, our teacher groups are full of lively discussion and thoughtful reflections. In August, some of us read The Trauma Informed School: A Step-by-Step Implementation Guide for Administrators and School Personnel. This book gave faculty the chance to think about how to address some of the challenging lives students may lead and build community systems and rules that respect their experiences. My leadership team also read Leadership is an Art by Max DePree. We followed up in September with Why Are All the Black Kids Sitting Together in the Cafeteria: And Other Conversations About Race. This book, by Beverly Tatum, sparked complex and thoughtful discussions about race and segregation, and helped us better approach the idea of diversity and inclusion. In December, we launched two groups. Some read Teaching with the Brain in Mind, a book by Eric Jensen about neurological development, which helped teachers re-consider how we plan lessons and activities, based specifically on the most current research on the developing adolescent brain. Others read Becoming the Math Teacher You Wish You’d Had by Tracy Johnston Zager. At the end of this month, we will start two new groups. Some will read Why Don’t Students Like School, a book by psychology professor Daniel Willingham. Others will tackle Make it Stick, a book written by psychology researchers and management consultants that focuses on memory acquisition. If time permits, we will read The Hidden Lives of Learners by Graham Nuthall. an education professor. Finally, we will end the year with Millionaire Teacher: The Nine Rules of Wealth You Should Have Learned in School. This semester we also kicked off book groups for parents. Dr. Smith is facilitating a study of The Teenage Brain. And, two of our faculty members are leading a study of Wendy Mogel’s The Blessing of a B Minus. See below for more information on this. There will be more to come after spring break. And even if you don’t participate in a school-sponsored club, we encourage you to dive into a good book. Happy Reading!